Biennials have moved on. They have been quietly shifting from large, single-city, exhibition orientated projects – the outcome of the curatorial endeavours of one curator, or maybe a pair – to other models. Although the original Venice/São Paolo model has not disappeared, and a wide-ranging exhibition is still usually the core public event of most of the international ‘biennales’, longer-term programmes with broader agendas and levels of engagement are gradually becoming the norm. The programme of the thirteenth Sharjah Biennial began in October 2016, continuing through five main parts until January 2018, with a year-long education programme in the Emirate itself, an online publishing platform and separate research depository, a series of off-site events in other locations, and a two-part public programme. In the wonderful way Arabic nouns can hold compound meanings within them, Sharjah Biennial 13’s overall title Tamawuj suggests liquidity, a rising and falling wave, fluctuating and flowing movement, non-linear forms and outlines. But there are powerful undercurrents in moving bodies of liquid, and they are only bounded (and rarely permanently) by the most solid and substantial of matter. As engineers and builders know, water will always find a way through. Tamawuj is thus more than a conceptual underpinning, it is an implementation of a method, but a method that is fluid and moving, which activates existing and other alliances and networks to produce new knowledge and familiarities, and is the medium for strong currents – in this case of thought, practice and action. The two-part public programme, encompassing Sharjah Biennial 13’s main exhibition projects, was not concentrated in one site with one curator but in two separate ‘Acts’. Act I, curated by the curator of Sharjah Biennial 13, Christine Tohme, opened in Sharjah in March, 2017, with the work of sixty artists installed across various venues, while Act II closes the programme with two exhibitions in Beirut, curated by guest curators Reem Fadda and Hicham Khalidi. For the parallel programme of four off-site projects, Tohme invited four interlocutors in specific sites to engage with some keywords, in collaboration with local researchers and participants, in an extended conversation with the Sharjah Art Foundation (the Biennial’s parent organisation), the Biennial’s programme and ambitions, and the specific sites. The four sites – Dakar, Istanbul, Ramallah and Beirut – are not arbitrary, but arise from tamawuj waves of movement through empathies, networks and relations. Neither were the keywords for each site – water, crops, earth and the culinary – randomly chosen. Essential for life, and hence for societies and cultures to exist at all, and inextricably bound together (the earth needing the water to grow the crops to produce the food), the keywords were also key to their particular sites. In Dakar, Senegal, in January 2017, artist Kader Attia organised a two-day symposium, ‘Vive L’Independence de L’Eau’ (Long Live the Independence of Water) with artists, film-makers, sociologists, poets, historians, scientists and philosophers, among others, covering a wide-ranging series of water-related issues. Dakar, a port and sea-trade city, like Sharjah, is surrounded the waters of the Atlantic, but, paradoxically, the availability of water, for both agriculture and for clean and safe consumption is an ongoing problem and challenge not only in western Africa but across the African continent. BAHAR, the second off-site project in Istanbul in May 2017, with its keyword of ‘crops’, coincided with the traditional ‘Hıdırellez’ festival in Turkey, and the wider region, that celebrates spring, the cycle of nature beginning its season of renewal. Originating in agricultural cycles of seed planting and animal husbandry, spring festivals and rituals have long histories in all cultures, and they are still of great relevance, even if generally unrecognised as such, in the structures of the annual schedules of industrial and post-industrial societies. The Istanbul interlocutor Zeynep Öz curated an exhibition and programme of performances, with a majority of artists and young artists collectives based in Turkey, that explored notions and themes loosely related to ‘crops’ through ideas related to seeds, and hence of dormancy, latency and potentiality. As Turkey plays out its political and cultural struggles with traditionalism versus modernity, and continues to develop from an agricultural economy to a more industrialised one, such themes seem apt. In August, 2017, the third off-site project, ‘Shifting Ground: The Underground is not the Past’, took place in the Palestinian city of Ramallah, centred around the keyword ‘earth’, and it is this off-site project that I would like to devote some closer attention to here. The interlocutor for ‘Shifting Ground’ was Palestinian curator Lara Khaldi, in collaboration with Rana Anani, a writer, and Yara Saqfalhait, an architect and researcher. In some ‘meticulous curatorial work’ (as one of the participants, Reem Shilleh from Subversive Film, described it) the project focused on producing a series of artists’ books and other publications, some performative events (‘non-academic lectures’) and an intensive four-day symposium, rather than a curated exhibition or exhibitions. Although there was nothing to look at, in the usual understanding of viewing an exhibition, there was actually much to see – only through different means of looking. In the uniquely Palestinian context, the practice and nature of exhibition-making, of the public display and visual consumption by others of the work of artists, has a chequered history and remains wide open to interpretation and development. It is to Khaldi’s credit that she did not attempt to emulate models imported from other, very different urban contexts, where galleries and exhibition spaces are intrinsic parts of the cultural life and infrastructure and where the parade around a series of private views on First Thursdays is ritually performed. The nature of these off-site projects was designed to stimulate and highlight research and be relevant to their localities, and not primarily to exhibit works of art fitted to a theme. ‘Shifting Ground’ was a highly discursive programme, and linked in a multiplicity of ways to its locality and context with the keyword ‘earth’ as its constellatory locus. ‘Earth’ can suggest the soil, the planet, the land, but as Khaldi stated in her opening remarks, in Palestine the very earth itself is being lost and so she ‘chose the subsoil, the subsoil of an earth that is shifting and moving all the time’. The subsoil is not so easily subjected to division and control. It continues underneath the geophysical and geo-social surface of the imposed borders and separations of Israel’s occupation. It holds within it the buried and hidden evidences, the unseen infrastructures of communication and utility supply, the roots that will travel wherever they need to go to reach the water and minerals they seek regardless of what happens on the surface. And although inevitably vulnerable to humanity’s toxicities in whatever form, rainfall, time and nature’s affinity to equilibrium (witness the Gaia hypothesis of a self-healing and regenerating planet) at least hold possibilities of change and renewal. The ‘Shifting Ground’ programme opened and closed with a couple of so-called ‘non-academic’ lecture/performances, but without their creators/lecturers being present. Both of the artists (Lawrence Abu Hamdan and Rabih Mroué), with their Lebanese identities (although I do not know what passports they actually hold), are not able to enter the Palestinian territories. With its deliberate policies of disconnection and isolation with regard to Palestinian social and cultural life, and of furthering the exclusivity of the Zionist concept of the ‘Jewish state’, the military occupier (Israel) controls all border crossings, and wilfully excludes passport holders from most other Arab countries, especially Lebanon, from entering. Hence, the Biennial curator, Tohme, was denied the opportunity of attending an event she herself had initiated. The ‘Shifting Ground’ programme deliberately highlighted the enmeshed ties of land and soil (and of history, language, culture and family) shared by Lebanon and Palestine, and the reality of the denial of the freedoms to live, activate and experience those ties. The opening event was planned to be a digital communications link to Berlin with Lawrence Abu Hamdan, who had planned to present Bird Watching, his audio essay on an acoustic investigation of Saydnaya prison in Syria. This had been presented at the Sharjah exhibition earlier in the year, so in opening the Ramallah programme it would have signified a tamawuj-link in more senses than one. Unfortunately, whether due to faulty technology or congested broadband width, or other more sinister interference, the link proved impossible to make and the attempt was abandoned. Thankfully more successful over the next few days were three of Rabih Mroué’s performance lectures, with their video montage projections, in Ramallah’s new City Hall, with Pixelated Revolutions (2012), and its opening line ‘Syrians are filming their own death’, closing the symposium. These extended ‘talks’ expounded with gritty realism, but also humour and irony, on aspects of Lebanon’s modern history and the legacies of the long civil war. As Mroué himself would also not have been allowed into Palestine, a writer and performer from Haifa, Asmaa Azaizeh, had travelled to Berlin to practice with the artist himself to perform his work, successfully somersaulting over and around the restrictions. The four-day symposium also featured other speakers who are able to travel to the Palestinian territories, as well as Palestinian anthropologists, writers, historians, architects, cultural theorists and artists. With no holding back – and with no concessions to any delicate sensibilities that may not have had exposure to, or were ignorant of such things – the first day launched directly into the subterranean, into considerations of the burial of the dead in Palestine, where what happens to the physical body after death is as much a political issue as what happens to it in life, if not more so. Abdul Rahim Al Shaikh, a professor of philosophy, cultural and Arab studies at Birzeit University, has been researching the cultural, historical and sociological aspects of Palestinian cemeteries, spaces in which he finds some sense of freedom in contrast to elsewhere in the fragmented and controlled Palestinian space. In his paper ‘I Die, Therefore I Am: The Palestinian Living Cemetery’, Al Shaikh considers the absurdist aspects of Palestinian death and burial. It could be said that it is only in death, through burial in the ground, that Palestinians are able to return to their land, but it is also in death that the denial of fundamental human rights, and freedoms, continue. For many, visiting gravesites of family members is impossible because access is prevented; for others, returning to the land in any form is not an option: refugees and the displaced cannot choose to be buried where their ancestors were laid to rest. Yet the dead are also proof of the living, they are harder to transfer or disappear (cremation is forbidden in Islam, orthodox Judaism and eastern Christianity, and not wholly condoned in Catholicism), although the Israeli occupier rides roughshod over the rites of respect and care normally accorded to places of burial. 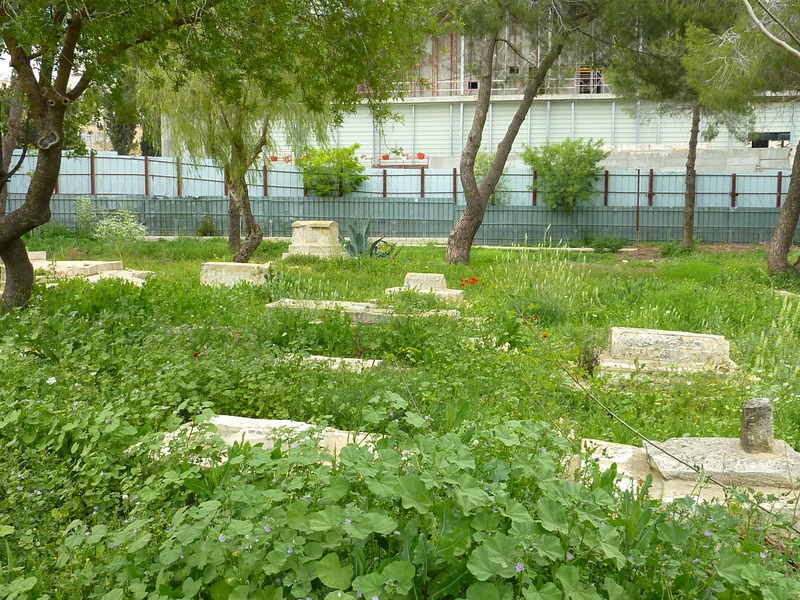 One case in point is the historic Islamic Mamilla cemetery in west Jerusalem, now in a sad state of neglect as it cannot be visited and cared for, and where the supremely ironic ‘Museum of Tolerance’ is currently being constructed by the Simon Wiesenthal Center over desecrated gravesites. Anthropologist Suhad Daher Nashif also considered the ‘life’ of Palestinian prisoners in death in her talk on the ‘cemeteries of numbers’, where, since the 1960s, Israel has interred in shallow graves the bodies of ‘martyrs’ or those who have died while in detention. Marked only with numbers, the bodies have never been returned to their families. Frequently the families were not even informed, and the all-important rituals related to death and burial have been denied, with the result that some families cannot accept that their family members are dead. (I suspect it was not a priority for the ‘authorities’ to make attempts at identification of those who may have died in situations of conflict, denying the Palestinian body in death even the most basic of rights: a name and identity that accords evidence of genealogy and a life lived.) Hence, again, we are reminded of the after-life of the Palestinian body, as ongoing efforts for information and identification are pursued through legal channels, although often with no outcome. Thus began a series of considerations of the sub-soil, the underground, the buried – from the practical issue of modern waste management (in a film by anthropologist Sophia Stamatopoulou-Robins), much of it non-organic and not biodegradable and increasing at a rapid rate but without the necessary land, infrastructure or political power to manage it effectively, to the sinkholes that have increasingly been appearing around the Dead Sea. Yara Saqfalhait’s presentation and publication, Subterranean Cavities, explored her research into this phenomenon where thousands of years of ecological balance are being destabilised through Israel’s mineral extraction industries in and around the Dead Sea, and through its rapacious drawing-off of water, from the upper reaches of the Jordan River that feeds the inland sea, for its agriculture projects further upland. Damage caused by a sinkhole near the Dead Sea, as seen in Yara Saqfalhait’s research project and publication Subterranean Cavities, 2017. Image courtesy of the Alamy photo collection. Artists Inas Halabi and Benji Boyagdian have researched different aspects of the underneath, in relation to recent history as well as the longue durée. Palestine does not have control over what happens on its soil, or under it, and Inas Halabi brought this out in her important project Lions Warn of Futures Present, where the poetry and visual metaphors of a work of art merge with research of serious relevance. 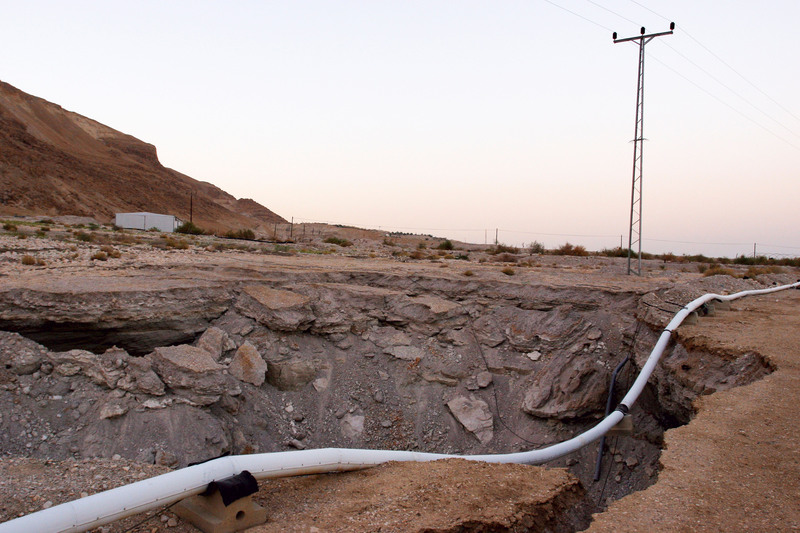 As far as she was able, given the difficulties of access to information, the artist has researched the secret dumping of radioactive waste in the southern part of the West Bank from Israel’s Dimona nuclear reactor in the Naqab desert, and how this has impacted on the villages and communities there. Ignorance, speculation and reality converging in a quiet tragedy of disempowerment.The ‘facts on the ground’ of the areas A, B and C of the Palestinian territory according to the 1993/95 Oslo Accords mean that this can take place in all areas designated C (under full Israeli civil and security control). Also featured in an artist’s publication produced as part of the publication programme, this project of Inas Halabi’s explores in a powerful poetics of image, language and colour (red, noticeably) the very real and present dangers lurking in the unseen and unknown, and in the imbalance of power. Radiation and toxicity are invisible and the damage they cause can potentially remain unrecognised until too late; nuclear, and chemical, waste is no respecter of human life or human timescales of decay. From Inas Halabi’s artist publication Lions Warn of Futures Present, 2017: photograph with red film of area where chemical waste is buried in the south of the West Bank. Courtesy of the artist. Benji Boyagdian’s research, also translated into an artist’s book with drawings, photographs and texts, looked at the history of the provision of water to the city of Jerusalem, in particular a Roman-built aqueduct and stone pipe system that carried water to Jerusalem (Aelia Capitolina) from the Bethlehem area, although the archaeological research is not conclusive (and is co-opted to serve other ideological ambitions). Water provision has always been an issue for Jerusalem at all stages in its history, and is an ongoing one in Palestine, critically so for the Gaza strip, and the ‘underground’ history in and around Jerusalem is a daily matter of conflict, and questionable interpretation. Jerusalem, like towns and villages across the region, and in Europe too, is on the site of several springs and sacred water sources, and Jumana Emil Abboud’s evocative performance Out of the Shadows at the Khalil Sakakini Cultural Centre on one of the symposium evenings was a reminder of the fact that under the troubled surface of the contemporary ground there are many such springs, still providing water in many villages and quietly bearing witness to history. They also live on in namings. Attached to place names such as Ein Gedi or Ayn Misbah, Ein, ain, ayn, ayin, in Arabic, Aramaic, Amharic (and Hebrew), means spring or source - and eye. 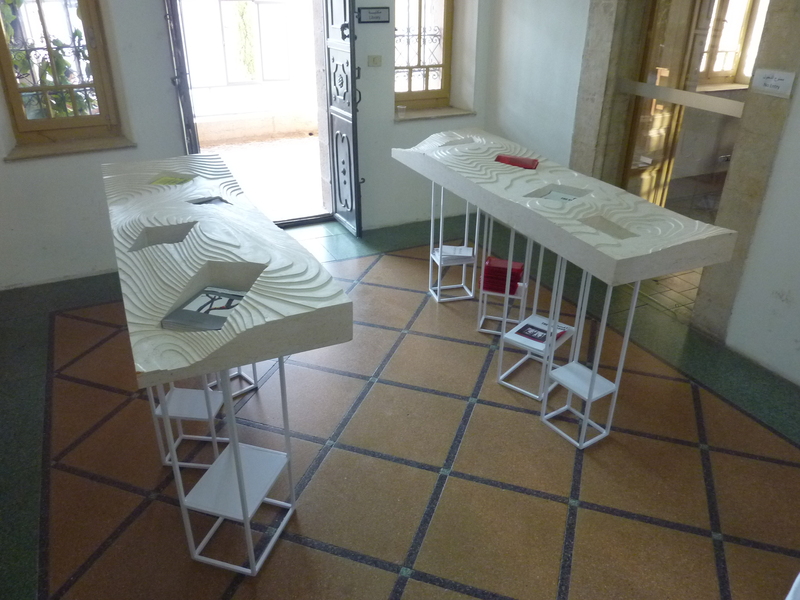 Although there was no exhibition as such, ‘Shifting Ground’ commissioned, enabled and produced a series of publications, mostly bilingual English/Arabic. An exhibition is temporal, and by definition fixed/installed/exhibited at a particular site, and reliant on the physical presence of the visitor to actually see and experience it. Producing a series of publications is in keeping with the conception of a more discursive programme, supporting research-based practice and inserting the results into the circulation of things rather than a temporary display aesthetically arranged on a wall. The publications can be distributed, shared, kept on a bedside table; they may turn up in unexpected places, sometime later, giving their contents an extended life-cycle that an exhibition does not have. Catalogues, of course, have a role to play in doing this, but they are never a substitute for the physical eye-and-body experience of the exhibition itself. 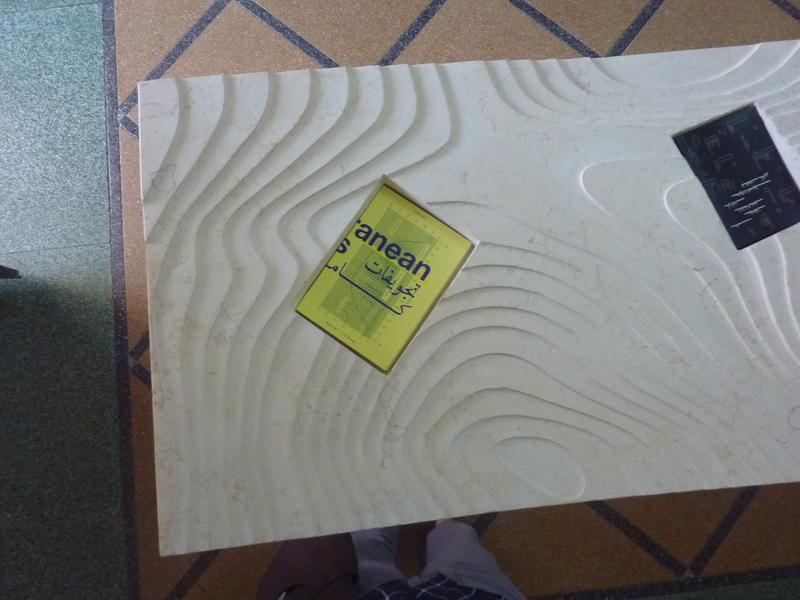 The ‘Shifting Ground’ book projects ranged from ‘artists’ books’ like Inas Halabi’s and Benji Boyagdian’s, an Arabic translation of Noor Abu Arafeh’s novel-as-a-work-of-art The Earth Doesn’t Tell Its Secrets – His father Once Said (the English version of which had been launched during the Sharjah events earlier in the year) to an account in the Morbid Symptoms, a small book by Mimi Cabell, Samir Harb and Nicola Perugini’s comprising research into the muqata’a or Tegart forts built by the British mandate across the region. The act and nature of research is a crucial one in this context, with its lack of an unbroken and peaceful history or centuries of quiet and safe archival storage. Subversive Film (founded by Reem Shilleh, Mohanad Yaqubi and Nick Denes) have been engaged for some years in research into Palestinian revolutionary film, in particular the Palestine Film Unit founded by the PLO/Fatah in 1968 to film the revolution – not simply to record it but as a revolutionary practice in its own right. 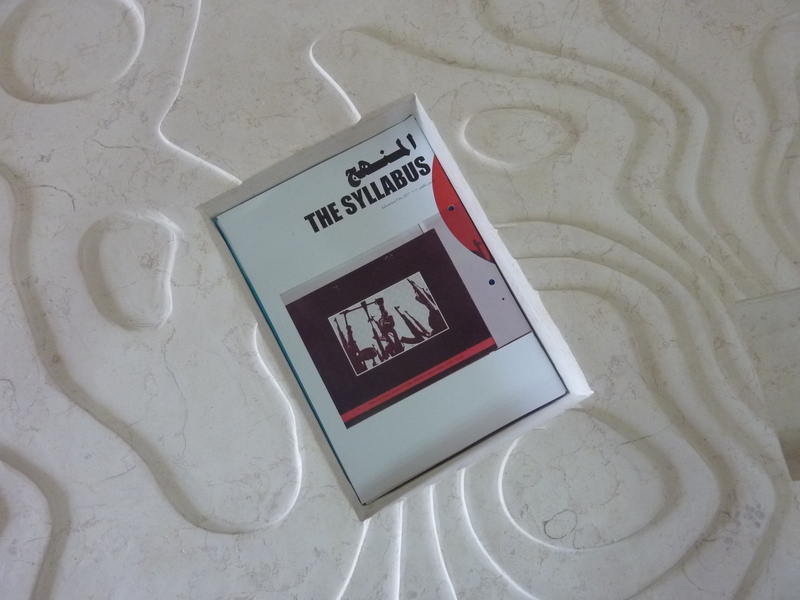 Their publication, The Syllabus, came out of this research after interviewing the widow of the film-maker Hani Joharieh, one of the founding members of the Film Unit. Joharieh was killed in Lebanon in the mid-1970s while filming in one of the civil war’s mountain battles. In a layered exercise of research into a history as yet unwritten and undocumented, The Syllabus publishes some handwritten notes of Joharieh’s, in facsimile and with an English translation and annotations, that seem to be an outline for a course in cinematography. It is a poignant reminder of revolutionary aims not achieved, of the lack of ownership of a people’s own history and the loss and dispersal of archival material, but also of the material mechanics and processes of filming and film-making in a pre-digital era. The Syllabus (originally commissioned for the 5th Riwaq Biennale in 2014–2016 but never realised) is also accompanied by an ongoing series of Supplements that continue the research and links it to other contemporary, collective revolutionary film practices. The first Supplement, also produced for ‘Shifting Ground’, published an interview with the Egyptian collective, Mosireen, about their film and workshop activities that began in the 2011 revolution in Egypt. This leads, through an extended understanding of the notions of the buried, the hidden and the loss of the material matter of history, to the question of ‘the museum’. Or vice versa. Ideas of ‘the museum’, ‘the archive’ and ‘the institution’ have been preoccupying ones in Palestinian cultural circles in recent years. There have been various interpretations and understandings of what a ‘museum’ is, what such an institution can and could be and how it should operate and best serve its constituency. After a long history, the privately financed and conceived Palestinian Museum finally opened in 2016, although not without some significant teething troubles that led to it opening as an empty building without an inaugurating exhibition or programme of any sort, and thus fuelling some unfortunate sensationalist publicity. The Museum has been perhaps the most public manifestation of this museum fever. In the absence of a functioning independent national polity and associated organs of management (departments, national institutes, etc) cultural policy is uneven and lacking in clear direction. Plans and actions are therefore subject to individual and disparate resources, and personalities, and differing interpretations. ‘Shifting Ground’ considered some things that are very specific to the Palestinian context: disappeared and lost artworks, records and archives; research efforts hidden and unutilised and subject to individual vagaries and changes of regimes. Yet artists, ahead of the game as they frequently are, have already been thinking about the ‘museum’, and producing their own interpretations. Noor Abu Arafeh’s novel, mentioned above, explores different imaginings of Palestine’s first museum, oscillating between fact and fiction and postulating on the obsolescence of museums. Khalil Rabah’s conceptual project, The Palestinian Museum of Natural History and Humankind, has seen various iterations (mostly in international exhibitions) over about fifteen years. Unfixed, unspecified, infinitely moveable and able to be reimagined and remade numerous times as it is never made ‘real’, one of the ‘Shifting Ground’ publications (still in progress) will be a handbook or guide to The Museum. The irony, humour, imagination, and the reality in the serious commentary of such an extended and ongoing project are, however, tricky to assimilate into the relative finality of the printed page of the book-form. I will conclude with two images related to ‘earth’ that have remained with me perhaps more than any of the other more obvious ones from ‘Shifting Ground’ (and there were many, even without the works of art displayed in a space or room that I secretly wished I could see). Both are images of sedition and steadfast refusal of injustice, of hope and investment in a future, and of change and the throwing off of oppression. The first is the image of Amilcar Cabral, who was one of the main leaders in the liberation of Guinea-Bissau in West Africa from Portuguese colonialism, although he was killed shortly before independence became a reality in 1973. Film-maker and artist Filipa César has been researching Cabral’s subversive double agency. As well as being a poet, writer and revolutionary thinker and theorist, he was also an agronomist and soil scientist, and was employed as such by the Portuguese colonialists. It was his travels around the territory in this capacity that highlighted for him the profound damage caused by colonialism and fuelled his determination to work towards liberation. The second image is of pieces of paper covered in tiny writing buried quite deep in the ground, below the level that might be hit by a plough, presumably in some sort of soil-proof bags or containers. These letters, writings and documents were smuggled out of Israeli prisons where Palestinians have been incarcerated (including currently, against all international conventions, over 300 minors) since the First Intifada until now (at the time of writing there are about 6,000 Palestinians in ‘military detention’ in Israeli jails; source: www.btselem.org/statistics). 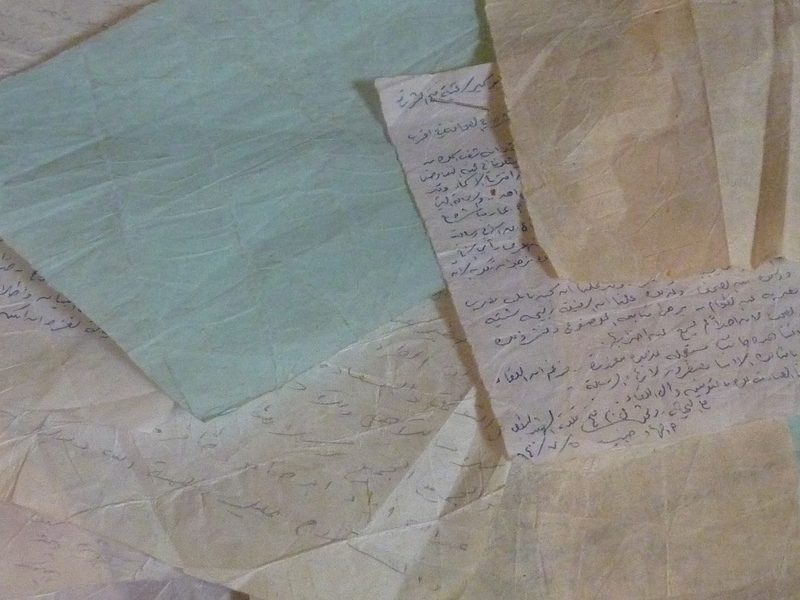 These artefacts and testimonies became the foundation of the Abu Jihad Museum for Prisoners Movement Affairs at Al Quds University in Abu Dis, a museum with a very different remit than most, as German curator and cultural theorist Doreen Mende has been researching. Established in 1997 before the Second Intifada, the Museum did not officially open until 2007. In the years before this date there was no dedicated building that could house and display this archive, the determined individual who believed this evidence to be one aspect of the Palestinian inventory of experiences that should be preserved, formerly a prisoner for seven years himself (and later the director of the Museum), buried them in the ground, in order that they were kept safe and hidden at a time when his home could have been raided by the Israel Defense Forces at any time. ‘Shifting Ground’s discursive programme of talks and presentations by artists, writers, sociologists, architects, historians, anthropologists, and others was rooted in and developed from a Palestinian context, with all the complications this implies and the realities of which need to be worked around. 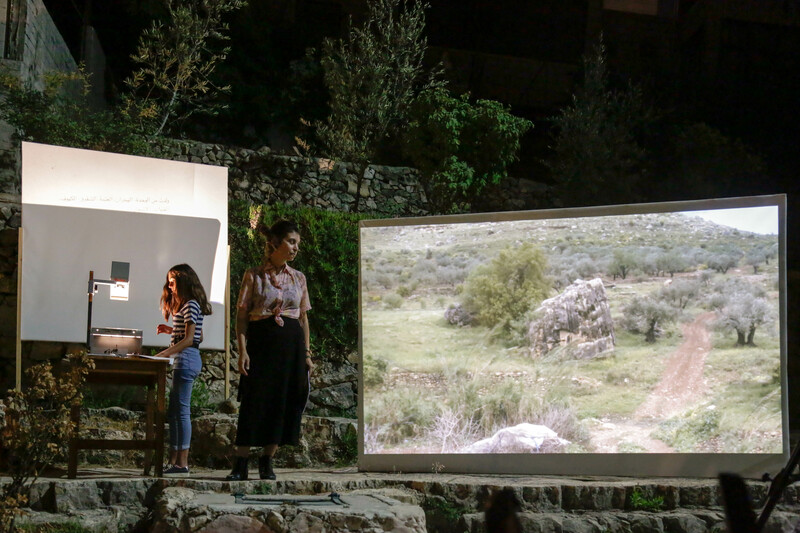 Although the event was centred in Ramallah, and attended by a fairly localised community from the intellectual and cultural milieu, the programme also included Rabih Mroue’s three performance lectures during August, September and October at the Khashabi Theatre in Haifa. 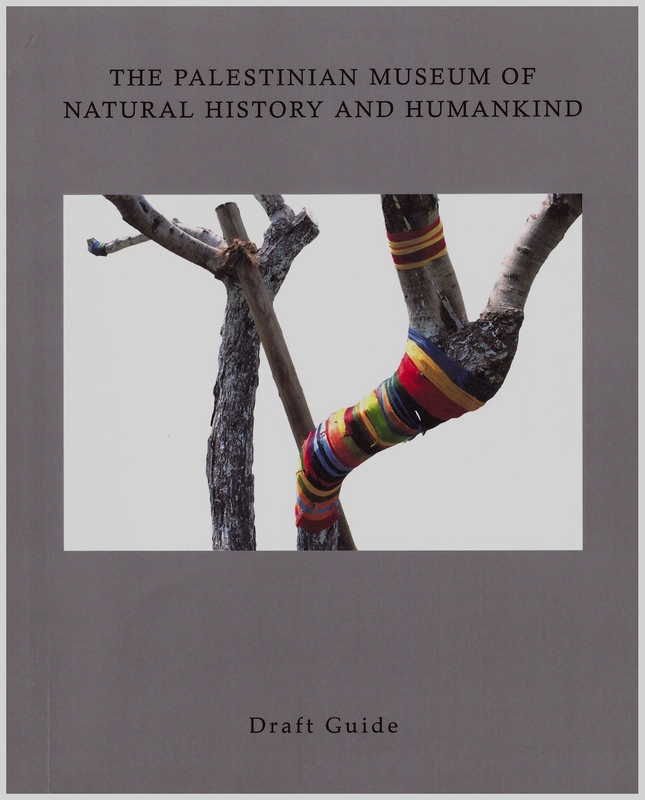 With its links of thought and image, from Sharjah to Beirut to Haifa via Ramallah, from the buried and hidden in the ground to the buried and hidden in museums, fictional or not, ‘Shifting Ground’ leaves its traces in the earth through the tamawuj of research processes and the different versions of their outcomes that constitute cultural practice as much as any painting or video work. To load me, hand and foot, in the scale of things. Nicola Gray is a freelance artist, writer and editor normally based in the UK. She has been collaborating with Palestinian artists and cultural organisations since 2002 on residencies, exhibitions, writing and publication projects.